For those crazy enough to try and save the Jordan River from developers, the enemy is always at the door. He’s taking me on a kayaking trip down the “challenging half” of the 55-mile river that flows north from Utah Lake across the Salt Lake valley and filters out into the shallow saline depths of the Great Salt Lake. He wants to demonstrate from the river’s perspective some of the problems developers have burdened the river with. For a couple of hours, I practice my novice strokes in a solo kayak in the slow-running part of the river at the Salt Lake County-Davis County border. Algae and dark, unattractive gunk drift past. Across the river, a Peruvian goat herder watches over part of an 800-strong bleating herd munching on Russian thistles at the water’s edge. 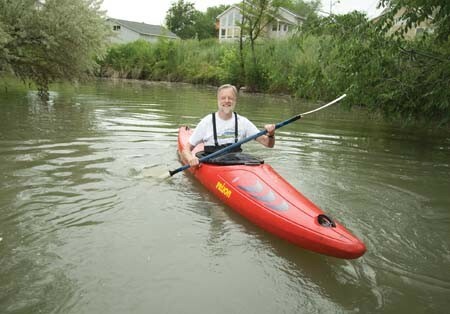 Satisfied with my fledgling skills, Boogaard tosses our kayaks in the back of his beat-up red truck, and we head for an entry point on the river by a new housing subdivision at the opposite end of the valley at 13500 South. Along with a life vest, the tall, lanky Boogaard, whose glasses magnify his intense stare, gives me a padded helmet to wear. “Stray golf balls,” he mutters, referring to the several golf courses he expects us to encounter going down the river. We don’t get as far as the golf courses, though. I tip over into the surging gray-green waters moments after pushing away from the bank. Undeterred, but drenched head to toe, I push out a second time. I start to get the feel of the rainand runoff-swollen river, even as the currents drive first Boogaard and then me under a bridge so close to our boats, we have to lean all the way forward to avoid colliding with it—a common Jordan problem, Boogaard notes. He shouts out instructions to paddle across the forceful current to the river’s inside bend. But I overcorrect and paddle instead into some low-hanging branches. The river spins the kayak around, then rolls it over. For a few frightening seconds, I’m caught beneath the kayak in the dark depths of the Jordan, panicking, fighting to get out. Then abruptly, I’m dragged out of the kayak by the current. I bob to the surface, gasping for air, trying to find the river floor beneath my feet, only for the river to rush me toward half-immersed tree limbs. I grab hold of a branch, but the river pushes me against the collapsed tree. The thought flashes through my mind how easy it would be to drown. I either have to let go and surrender to the river or get further entangled in the tree as the water bears down on me. I let go, shoot under the branches, then float for a moment, twirling round as if on an amusement park ride, before I manage to stand up and fight my way to the bank. Boogaard patiently paddles ahead in the river, having already secured my errant kayak. Eventually, I meet up with Boogaard under the bridge that carries the Bangerter Highway over the Jordan. A newly built dirt road curves around from Bangerter to parallel the Jordan for a good half-mile. It turns out the road is for South Valley Sewer District’s estimated $135 million sewage treatment plant yet to be built. “Here we go again,” Boogaard says, when he sees the raised dirt track plowing through lush farmland. One more development to monitor on the river this bachelor loves. Boogaard’s passion for the Jordan is infectious. How else to explain my decision, despite an utter lack of boating experience, to kayak down a fast-flowing stretch of the river? But then, the few men and women, most of them in their 40s and 50s, who are fighting for the Jordan’s survival are understandably myopic when it comes to their quest. Among those, along with Boogaard, who yearn for the unruly, meandering creature it was many decades ago are three key activists: Ray Wheeler, a wiry, white-haired adventurer and 30-year space planner for the University of Utah; the laid-back Zach Frankel, founder of nonprofit Utah Rivers Council; and red-haired, former Great Salt Lakekeeper Jeff Salt, arguably the most controversial figure in Utah environmentalism, even before June 2, 2008, when he allegedly badly beat his then-girlfriend with a pipe. On July 8, Salt is going on trial in 3rd District Court in Salt Lake City for a felony count of aggravated assault. Salt won’t comment on anything related to his legal problems. Boogaard works for Salt Lake City’s water department identifying leaking water pipes. He and Wheeler, are, says the latter, “ministers without portfolios,” fighting for the Jordan on their own time. It can be a bitter and exhausting battle. Frankel says the Jordan is symbolic of the problems facing all rivers in Utah. Unlike states as diverse as Idaho, California and Washington, Utah has no statewide river protection act, he says. 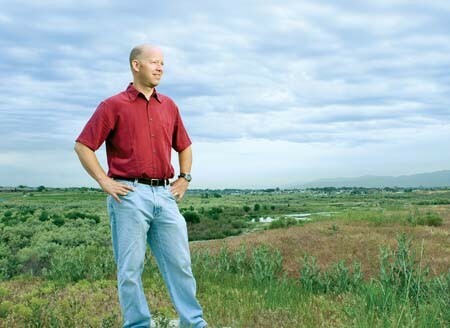 While Utah’s rivers may have no legal protection, the Jordan can at least claim the Blueprint Jordan, published in December 2008 by nonprofit Envision Utah, a $300,000 plan funded by Salt Lake County, other municipalities, grants and donors. It included surveys of 2,000 people weighing in on the Jordan’s future. Wheeler sat in on planning discussions relating to the Blueprint. He learned, he says, that municipalities had identified 14 locations for commercial and residential developments. 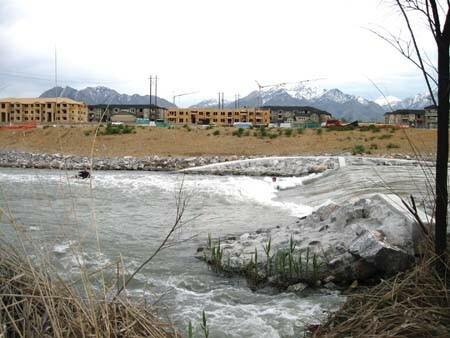 Envision Utah’s report describes some of these developments as regional river centers that include “recreational-support facilities and dining opportunities.” The report shows nine possible sites, three of which would be in Salt Lake City. The “river centers,” the report acknowledges in the final pages, would include mixed-use development concepts, including commercial and residential properties. Activists like Ray Wheeler are acutely aware they are fighting to preserve undeveloped land while having to acknowledge the political reality that pieces may well be sold to developers to fund the purchase of other chunks of the shrinking wilderness.